Your mild brown hair in a pageboy cut, that you grew out slowly over four years, but never decided on what 70's style suited you next. Your blue eyes wide, the skin around them older than the rest of you, from books you'd read that no one else on staff had heard of. Your cheese sandwich every day, and a carton of milk. You placed books you knew I'd like jutting out from the library bookshelves. You helped me choose a book prize for being Most Improved Grade 4 Student, and steered me past the cartoons to a book on nature. I read it to this day. You tapped the picture of the bear and cubs. You knew my totem before I did, by a good twenty years. You read my first stories and said they were good. You said to keep going. You said to keep going. I file you here, in the library of mind and page, bookmarked and stamped 'Out'. For by now, you would be dead, never knowing you lit a fuse. This would have been a school librarian, obviously. I was employed as the other kind, a municipal librarian, many years ago, beginning as a children's librarian. As a child it was the local municipal library which was most magical for me, though I made a lot of use of the school library too. I am eternally grateful to my parents for encouraging my use of libraries. They were keen readers and library users themselves – but also, it occurs to me now, they just couldn't have kept up with my reading if they'd had to supply all the books. I'm also grateful to the head librarian (Walter Sutherland, Launceston City Library, Tasmania; let's honour his name) who granted my parents' request to let me use the adult library before I was officially old enough, when I ran out of things to read in the children's library. And that's what this poem is about, more than the library itself – the librarian who unobtrusively encouraged a child's passion for reading, to be fully appreciated for it much later. There were various adults who did that for me, very much including parents and grandparents, aunts and uncles. Above all, I recall specific teachers, all the way through from kindergarten to the final year of High School, who fulfilled a similar role to the librarian in this poem. How valuable such mentors are, and how good to celebrate them! So who is Dawn Bursey? Well, she is the subject of this poem, and not the author as I first posted! I see poems online and grab them for my PU columns, so I have a stash – although I also slot in anything topical while it still is. As you've observed, as a courtesy I ask living poets' permission to use their work and their photo, and for some biographical details for interest. But this poem in my files has no information except the author's name, and when I Google search her now I can't find her. I can find the name, but clearly not attached to this poet. This surprises me, in view of the reference to her 'first stories' and the assertion that she kept on, which suggest some public, adult authorship, as does the very existence of this poem. But there it is. So I'm sorry: although I can post this legitimately 'for study and review', I can't supply any details about its author. If anyone happens to know her, or how to contact her, I'd appreciate a heads-up. It would have been nice to let her know how her prose poem resonates with another passionate reader – but then, I expect many others have already told her so. I'm sure it will resonate with the passionate readers here at Poets United too. As to the identity of the author, in your own 2012 interview with Helen Patrice, she says: "By the end of primary school, I was showing my stories to the librarian, Dawn Bursey, who bless her, encouraged me." OMG!!! I realised this must have been one of Helen's poems, ABOUT the said Dawn Bursey, not by her. When I checked, she confirmed this. Luckily she is more amused than upset by my error. Helen's a close friend and we sometimes send each other our poems by email. 'Prose poem' must have been the description on this, and 'Dawn Bursey' the title. I must have saved it for future reference some years ago, and by the time I posted it here had forgotten it was Helen's. As you see, I have now corrected this post. And if you'd like to know more about Helen, look for the tag on her name on the left-hand side bar for times she's been featured here before, or check out my 2012 interview. There's a lesson here for me, to be more careful when saving stuff, even if I think I'll never forget the details. And a lesson for us all – ALWAYS sign your work, even when only emailing it privately to a friend. My art teacher Val Anderson taught me that, long ago. 'Claim your work,' she would say to all her students. 'Own it.' It applies just as well to writings as paintings. However this is not Helen's fault but mine. Apologies to her and you, and many thanks to 'thylacine'. Material shared in 'I Wish I'd Written This' is presented for study and review. Poems, photos and other writings remain the property of the copyright owners, usually their authors. I'm glad you did! Thanks for alerting me to my error re authorship. I enjoyed this poem and your reflection, Rosemary. 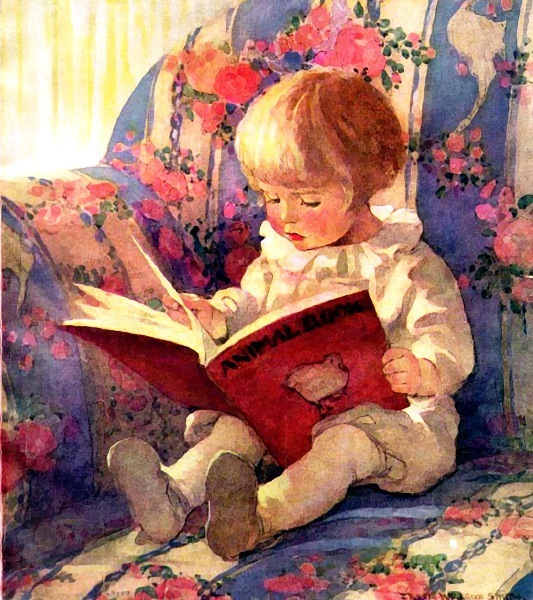 Though I don't remember any particular librarian from my childhood, I do have wonderful library memories....as my mother and I would go once a week and both come home with a delightful armful of books to read! How very cool that the librarian in the prose poem caused books to jut out so that they would be discovered by Dawn...now that is a librarian who took her job seriously! So nice that you selected this poem in spite of the author's lack of fame. I enjoyed the poem. Though I don't have memories of librarians, the poem made me think of special teachers who individualized my needs. Oh, I don't choose these pieces on the basis of authorial fame, but I do like to tell you all a little about the authors when I can, for interest's sake. This is so cute and so sweet! We all began somewhere...for me it was a tiny library in my small town, I would ride my bike to the library, and spend all day. Probably read every book in the little library. It just seemed what you did, I didn't think of it as out of the ordinary. I don't remember, but my Sister remembers, the librarian smoked and the tiny two room library smelled of smoke. It was another time. What a fantastic tribute to libraries and librarians everywhere. So personal, but the reader is immediately transported to memories of both. I remembered all of them, as I was a bookaholic (my word for the addiction). From my first experience to other more recent ones. I loved the hush, and the accompanying rush at the new worlds and people I was about to meet. One librarian stands out to me. Her name was Mrs. Smith. My first week in high school, I found the library and haunted it. By my third month, she had shown me how to use the catalogue files, and a month later, asked me if I'd like to work there during study periods. A dream come true. After marriage,divorce, and college, my first full-time employment was as the General Manager of a New/Used Bookstore. Not a big surprise. Thank you, Rosemary, for this wonderful essay on what libraries and those who work there achieve on a daily basis. Elizabeth, your comment just reminded me of looking through the files of books on hand at the public library, not that many decades ago, just before computers, when the card for each book was hand printed, and you had to take it to the librarian and have her stamp your book in and out.....wow. Had forgotten that. I LOVE this poem. I started making my weekly walks to the library when I was five, and have carried home an armload of books every week since.....through thick and thin..........books have kept me going. I love that the librarian left books she knew the child would like sticking out for her to find. Sigh. A gorgeous poem and a feature with which I resonate. I often thought I would have loved to be a librarian. How cool that you were. This poem and post certainly hit a chord with me. I, too, have fond memories of both school and municipal libraries. My favorite library was an old turn of the century building - lots of wood and leaded glass windows. I'd often take my children there during the day, to kindle their love of books and sometimes, after supper when I needed a break, I would return (alone with their Dad left in charge of board games and bedtime) as the sun was setting ... the rays hitting those wonderful windows. Magical times. I'm glad you all love the poem – especially as it turns out to be ABOUT Dawn Bursey, and BY my friend Helen Patrice (who is not an entirely unknown writer, lol)! I've now corrected the post. I'm so glad I passed by, and though my imaginary librarian is more there for himself... or maybe a university librarian... I can see there is something there in common. Wonderful. I have found libraries and librarians essential to freedom. As a retired Library Assistant, I find this poem charming and fulfilling. I spent many years working in Children's Library and keenly remember my years as a story teller on Saturdays. And along with other library assistants taking children of our Saturday book club on site seeing tours. In those day we did not have a National Library as impressive as it is today (NALIS) back then, it was The Central Library in Port of Spain where I worked and enjoyed very much my job as a library assistant.